In 1972, Eddie Osterland became America’s first master sommelier, and is today one of 87 in the United States. * I sat in on his recent wine master class, sponsored by ASC Fine Wines and held the St. Regis Hotel in Beijing, and will have notes on his (sometimes unorthodox) serving methods. For now, here are snippets from an interview he held with several reporters afterwards (I separated my questions from those of the journalists). What’s the perception in the US of China’s wine market and Chinese wine? No one has told people anything about it, so they know nothing. The question [you get] is, “Do they make wine in China?” Look at me, I’m a master sommelier and I’ve never tasted Chinese wines. I can’t find any in the United States. I will make sure to try it on this trip. You became a master sommelier in 1972. For 36 years since, you haven’t been to China, so why is it suddenly on the map? I said, “I don’t know anyone in China,” but I never forgot what he said. [Through a friend in Honolulu, Osterland got in touch with someone who spent time in Shanghai] and she said, “Oh, I know that the most important company for importing wine in China is ASC Wines, Don St. Pierre – I know him. So she told Don St. Pierre about me and that was one year ago. And then we had emails for six months. So we met. He came to my house and we liked each other right away. Six months went by, he came back, and we had another meeting, and finally he says, “I think China is ready for your program.” He says, “Let me take a gamble. I will pay to bring you over and do these presentations because I strongly believe that the only way to get better about this is by educating Chinese people [about wine].” … So that’s how I got to China. Wage levels in China are lower than the US. Let’s say you’re a young wine lover, 25 years old, very limited budget – where’s the value for money? Can I give you four common Chinese foods and get your picks for what wines would match with them? The first one is Peking duck, which can be pretty fatty. Peking Duck and Pinot Noir from Burgundy, France, because it has the acid that will cut right through the duck meat. I think the best white wines that go with somewhat spicy Chinese foods are unquestionably German Riesling, Alsace Riesling, and Sauvignon Blancs, especially from France. Sancerre, that’s a lovely wine for Chinese food. For spicy, but not too spicy, French Burgundy, white Burgundy. Those are truly my favorites. [If it’s very spicy?] Beer. If the food’s too hot, it kills the wine. I think the greatest wine with lamb is French Bordeaux and Bordeaux is very popular in China. I went to a supermarket and I think 80 percent of the wine was Bordeaux. I lived in Bordeaux for four years and they eat lamb and they drink their wine with it. How about a Chinese food created in San Francisco – fortune cookies? A fortune cookie is good because it is not too sweet. Let’s talk about dessert wine, sweet dessert wines – the wine must be less sweet than the wine and most desserts are too sweet, so the wine tastes dry, acidic. If you have a nice dessert wine… you don’t have to have dessert with it, let it stand alone. 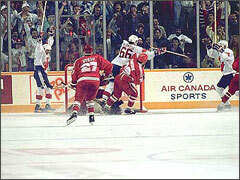 *Canada beat Russia in the 1972 Summit Series and repeated the feat in the ’87 Canada Cup. Coincidence? It’s fine with Chinese food, but some people like to match grape wine, and that’s an evolving art. Mr.Wine Veteran,how about chinese achohol goes with chinese food ?